Everyone's a little shaky after their divorce. So many questions and doubts come into play, adjusting to life without a spouse and then learning to let someone new in. The holidays can be a rough time for many moms, dads and stepparents as well. Everyone's a little shaky after their divorce. So many questions and doubts come into play, adjusting to life without a spouse and then learning to let someone new in. 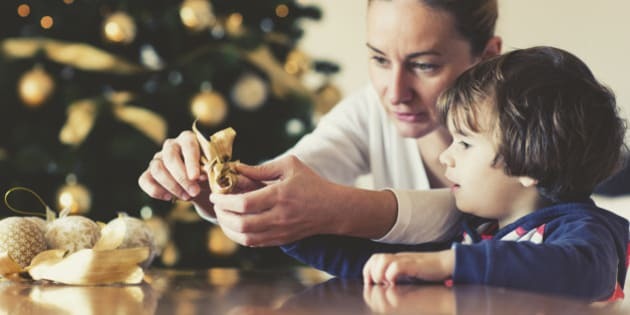 The holidays can be a rough time for many moms, dads and stepparents as well. Over the holidays, some parents will be experiencing their first time without their children and for others; it has become a new satisfactory way of doing things. Not too long after my parent's divorce, my dad had a new partner. His new life partner then, was very nice and empathetic until my siblings and I took too much space according to her perspective. It came to a point that my dad's new life partner gave him an ultimatum, "It's me or the kids." Well, sure enough, just as my dad had always said, "no one comes between me and my kids" he decided to end the relationship, confident that one day the right woman would come along and accept his children. And she did. The blended family is becoming the most common type of family in the world and researchers estimate that it takes an average of two to five years to successfully blend a family. Step-families need time together in order to bond and figure out the new relationships. In my family, in order to create a loving and a well-blended home, we had to set some time alone to discuss family issues. No one wants a nervous, guilty, angry person exploding onto the scene with his/her kids. Let's face it; a new partner of either spouse is a difficult transition for both the children and the parents' new partner. Healing is an important process to move forward prior to getting into a new relationship and forming a blended family. You cannot heal what you refuse to acknowledge. When you open your heart and mind to the healing process, you need to do it for yourself and your children, so miraculous changes can happen. In order to live a harmonious life with your new partner and your blended family, it's important to heal your past wounds. Healing takes time. A lot of self-care and effort is required. Setting yourself up for success and relieving the stress is a one day at a time process. Be active in your communication, say what you mean. The simplest decisions you make on your own could be damaging to your new relationship, your children and stepchildren both now and later. New relationships and forming a blended family does take time to bond. Release any expectations. Have patience and be flexible, nothing says you can only celebrate on the official day. You can be flexible and celebrate on another day, this could work really well with other family members who may have other commitments. Don't get discouraged. It all works positively in the end. I hear so many parents say that their new partners are often on their children's and stepchildren's back and their automatic first reaction is to defend their child which can often result in arguments. That's why it's very important to be clear and specific in your expectations. Narrow your differences in your blended family by compromising with your new partner what really needs to be understood, accepted from both of you in order to move forward in love and harmony. This encourages a healthy family environment. Your new partner needs to accept and understand that you and your former-spouse are co-parents. You and your co-parent need to be in communication with one another regarding the children. In this regard, your new partner must accept and understand that this is all about doing what is best for the children. Be a positive role model. Balancing all the elements of this new reality requires effort and conscious communication for the children's sake. Live with integrity, clarity and simplicity. Start creating new routines for the love of your blended family with your partner to maintain positive changes for a successful family environment. My wish to you is to enjoy the holidays to the max with your children/stepchildren having loads of joy, laughter and make this a memorable one and think about co-parenting in harmony.